Sprinkle the cut sides of the tomatoes with salt and pepper. Grill or broil the round, uncut sides of the tomatoes until slightly charred and easy to mash. Set aside. Spread one side of each slice of bread with butter. 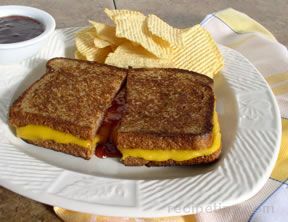 Place the cheese over the unbuttered side of 2 slices; top each with 3 slices of bacon and drizzle with maple syrup. 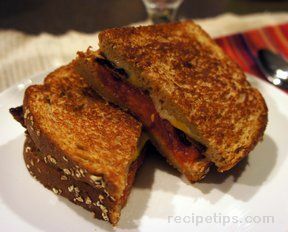 Top each with 2 grilled tomato halves, mashing down slightly, then cover with remaining bread slices, buttered side out. 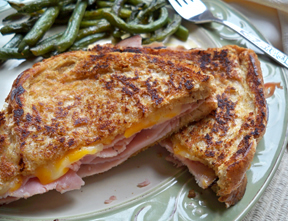 Grill with sandwiches in a skillet over medium neat 3-4 minutes per side or until golden brown. "Great sandwich to serve beside some soup. Make sure you have a sturdy bread so the tomatoes don't make it soggy. Maple syrup was surprisingly good."